The Peak District is made up of two areas The White Peak which is a limestone plateau of green fields with rolling hills and many dales and The Dark Peak (or High Peak) which is a series of higher, wilder and boggier grit stone moorlands. The Peak District is also known as the Derbyshire Peak District and also covers areas of Greater Manchester, Staffordshire, Cheshire, West Yorkshire and South Yorkshire. Although there are no prominent boundaries the central and most rural area of the Peaks lie within the Peak District National Park. The Peak District National Park Authority provides public facilities such as car parks, public toilets, visitor centres and also maintains the rural nature of the park although most of the land is still owned by the traditional landlords. Monsal Head is a famous beauty spot with spectacular views down Monsal Dale to the left and in front up the Wye Valley to Miller’s Dale. There are two pay and display car parks, a long stay if you wish to walk and a short stay if you only want to sit and admire the scenery, a picnic area, public toilets and the Monsal Head Hotel, restaurant and Stables Bar has B&B accommodation. The River Wye, below Monsal Head, is a limestone river and is one of the major tributaries of the River Derwent. It stretches 15 miles from just west of Buxton passing south of Tideswell, through Millers Dale, Monsal Dale, Ashford in the Water and Bakewell then south of Haddon Hall to where it meets the River Derwent at Rowsley. The river is one of Derbyshire’s most popular rivers especially with anglers because of the large amount of wild Brown Trout, Rainbow Trout and Grayling it is also home to a large population of Water Voles. 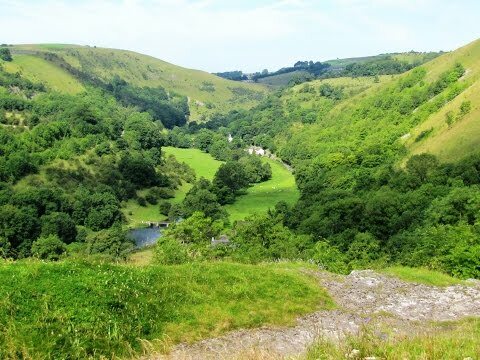 Miller’s Dale is a beautiful and popular part of the Wye Valley and much of the area is a Site of Special Scientific Interest and the dale was once an important railway junction and after the railway closed in 1970 the station became a car park and an access point to local walks. Cressbrook situated on the River Wye was built around the cotton mill and consists mainly of former mill cottages and a few older buildings which were lead miners cottages. The mill was at its prime in the 19th century producing high quality cotton for lace making but after World War 1 the local mills fell into decline and cotton spinning ceased in 1965. Cressbrook Mill finally closed in 1971 and was left to decay for some years before being restored. In 1828 Litton Mill was one of the most notorious workplaces in England where children were employed as slaves and were starved and tortured. By 1830 this child slavery became common knowledge after Robert Blincoe published his story and caused an outcry. As a result new factory and education acts were passed to protect children from the worst abuses and the mill closed. Monsal Dale is a valley formed from an uplift of limestone in the centre of the sandstone and shale’s, having long ago been under water, known as the Derbyshire Dome or the White Peak. Monsal Dale is also a Site of Special Scientific Interest, a Special Area of Conservation and part of a Europe wide network called Natura 2000. The impressive viaduct over the River Wye immediately after the Headstone Tunnel was built in 1863 by the Midland Railway and at the time it was seen as destroying the beauty of the dale. The viaduct known as Monsal Dale Viaduct is 300 feet long with five 50 foot span arches which are 40 feet high in the centre, at first there was some slippage and remedial work was carried out in 1907-1908 and a preservation order was placed on it in 1970. The closure of the tunnel and railway came about in the late 1960,s and as from 2010 work has been carried out to reopen the tunnel as part of the Monsal Trail. The viaduct is already part of the Monsal Trail and is a “listed” structure. The Monsal Trail is approximately 12.5 miles long following the former Midland Railway from Blackwell Mill to just beyond the former Bakewell Station. The Peak District National Park has spent £2.5m on re-opening the tunnel on the Monsal Trail. It was opened in May 2011 so it is now possible to walk, cycle or horse ride along the whole of the dismantled railway line from Blackwell Mill cottages to Coombs Viaduct which is approximately 1.5 miles past the former Bakewell Station. We park at the side of the road on the road opposite Monsal Head Hotel. We walk to the right of the hotel and through the short stay car park to the gap in the wall and the footpath sign. After admiring the breathtaking views we follow the footpath sign to the right downhill to Monsal Dale Viaduct. We turn right on to the viaduct (the tunnel to the left has been renovated and re-opened in May 2011) and keep heading forwards along the Monsal Trail until we reach Cressbrook Tunnel where we leave the trail and turn right through the gate. We keep following the little path on the side of the slope with the river on our right and Cressbrook in the distance until we come to a weir where we cross over the bridge and follow the path with the river and mill pond on our left. We pass by Cressbrook and into Miller’s Dale and eventually come to the factory buildings at Litton Mill. We walk between the buildings and take the footpath on the left just past the telephone box sign posted Monsal Trail and walk over the bridge and turn right onto the Monsal Trail. We walk forward for a short way to the bridge and walk up the steps on the left then at the top we turn left over a stile and then head steeply uphill through the field to the right hand corner where we go over a stile and follow the fence, still going uphill, on the right for a short way then go over the stile on the right. We turn left then bear right through the field towards the trees and when we see a post with a yellow band round the top we turn left over the stile and walk through another field, keeping to the fence on our left. At the end of the field we come to a watering hole where we go over the stile in the left hand corner onto a track. We follow the track and at Middle Farm Holiday cottages on our left we turn left at the t-junction and sign post for Monsal Dale. We walk in front of some houses and continue on the path through the fields and then bear to the left of a tree with a sign post on the left we head forwards then turn right at the next sign post for Lees Bottom. We head forwards through the field and go through the gate way to Brushfield Hough Farm and walk between the buildings then at a no through gate we turn left and follow the track round to the right and when the track bends to the right we go over the stile on the left into the wood. We follow the path downhill until we come to the River Wye and Lees Bottom. We now turn left and follow the path with the river on our right though Monsal Dale until we come to Monsal Viaduct. We walk up to the viaduct on the path to the left and then retrace our steps back to Monsal Head Hotel. This is a moderate walk on good tracks and paths and over grass fields. There are some moderate inclines and declines but the disused railway line (Monsal Trail) is easy walking. Approx 6.25 miles allow 2 hours 45 minutes using OS Explorer map OL24. The Peak District – White Peak Area. Monsal Head is near Bakewell in the Peak District of Derbyshire. From the M1 take junction 30 and take the A619 through Chesterfield and Baslow to Bakewell. From Bakewell take the A6 to Ashford in the Water. Just at the far side of Ashford in the Water immediately after the bridge take the B6465 on the right and Monsal Head is less than 2 miles. There are two pay and display car parks, long stay 24 hours and short stay maximum 2 hours and a picnic area next to the Monsal Head Hotel and also some free road side parking on the road opposite. There are public toilets in the car park at Monsal Head and also at Lees Bottom car park and picnic area. For refreshments there is the Monsal Head Hotel at Monsal Head. There are also public toilets, a shop, a pub and a hotel in nearby Ashford in the Water and in Bakewell there are toilets, shops, cafes and pubs. I’m live in Poland, but I visited UK on my holiday and I found Your site very interesting and usefully. It’s probably obviously for British, but not for strangers, who don’t know this area. Thank you Tomasz for bringing this to our attention. The wrong road number has now been changed to the right one. We are also very pleased that you found our site interesting and useful while on holiday in England. We hope you keep following our website and pass it on to your friends. The next time you are in England why not visit the Lake District the walks and the views are fantastic. Take a look at our latest walk there “Helvellyn from Glenridding”. We are sure once you have been there you will be hooked forever.